Hurricanes like the one that hit Houston, Texas last August do a lot of physical damage— cars, home, buildings— but they can also rip the fabric of communities. 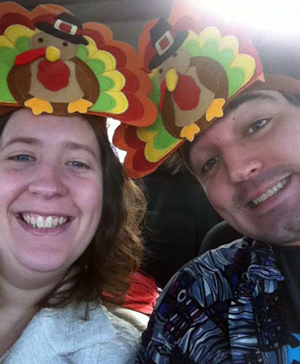 In the aftermath of that kind of tragedy, many communities struggle to get back to "normal." One such community was South Houston Elementary, where Maria Garza's 8 and 9-year old kids attend school. As part of a broader hurricane recovery effort, KaBOOM! 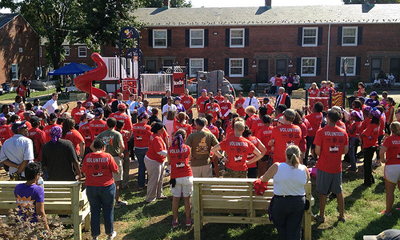 and UnitedHealthcare teamed up with Maria and the rest of the community to rebuild the school's playground. The moment Maria heard about the project, she deemed it "awesome!" and rallied her family and friends to get involved. Together they transformed more than a schoolyard. Maria and her family happen to live right across the street from the elementary school, and she had a vested interest not only in the school community, but in giving her kids a great place to get out and be active. "I'm all for something more healthy and exciting for the kids that will get them outside playing instead of inside sitting around looking at screens," said Maria. And the existing playground had seen better days after the hurricane. Maria jumped right in on the KaBOOM! playspace Design Day. 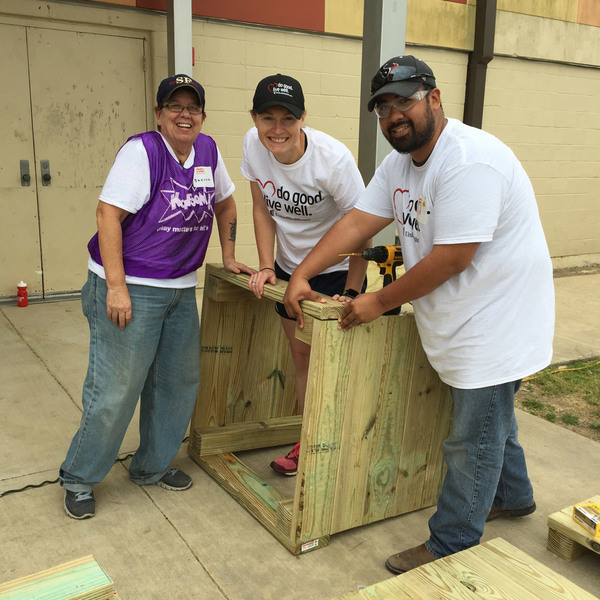 She helped generate buzz and excitement among her family, neighbors and friends and convinved them to volunteer a few weeks later on Build Day. That was on March 24, 2018, which also happened to be her daughter's 8th birthday. I could feel it. This is good for the kids, and good for the community. Working with KaBOOM! on the project was wonderfully surprising for Maria. "It's something I had never experienced before," she said. "KaBOOM! guided us through the whole process. From the initial conversations and gathering support, to recruiting neighbors and even tightening play equipment bolts on build day. Best of all, the KaBOOM! people work with you. They help you. It's like a big family." Maria remembers taking a break that day and pausing to look around and really take it all in. "I'm going to remember this always. We came together with our neighbors. My husband was even there doing a wood construction project," Maria said. "We built this together. It's a really special day." Today, right through her window, Maria can see both kids and parents are already enjoying the playground as a community gathering spot, whether they're there to exercise or socialize. Even in the aftermath of tragedy, Maria found herself surrounded by smiles, laughter, joy and a real sense of community. 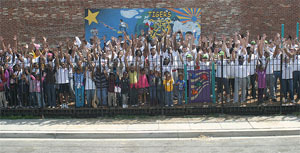 We had a dream—to turn an abandoned public school site into a playground, a park, and a community center. Piece by piece, our dream is becoming reality. The Jefferson Elementary School closed in 2005 and its facilities went into a state of blight. 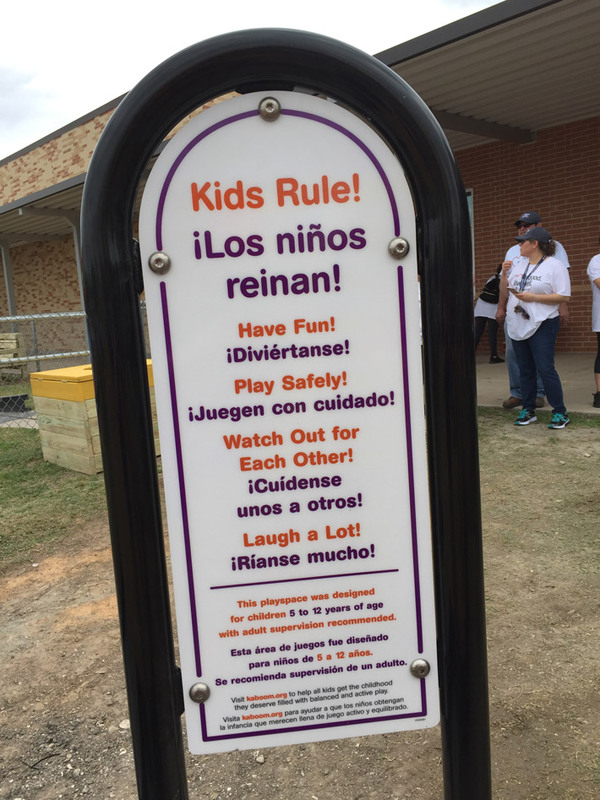 When it closed, officials took away the playground equipment, installed a chainlink fence around the schoolyard, and put up “No Trespassing” signs. But that didn’t stop kids from playing there. They used to crawl through the fence or pry the gates open to get in. There was no playground, but they were running around the schoolyard and playing with a huge truck tire. The neighborhood rallied together and we were able to raise enough money and secure financing to obtain ownership of the property. The first thing we did was to open the gates, and the kids and all their brothers and sisters came pouring in. Then we started reaching out for grants and partnerships everywhere. We always knew what we wanted; what we didn’t realize is that if we just got started, the energy would build on itself. One day, kids were pushing a tire around the schoolyard and the next day, PG&E and KaBOOM! came forward with a grant for a new playground. I can’t tell you what a difference the playground has made. It has been a magnet for everyone to come and bring their kids. Kids now know their neighbors—we’ve restored the community commons. 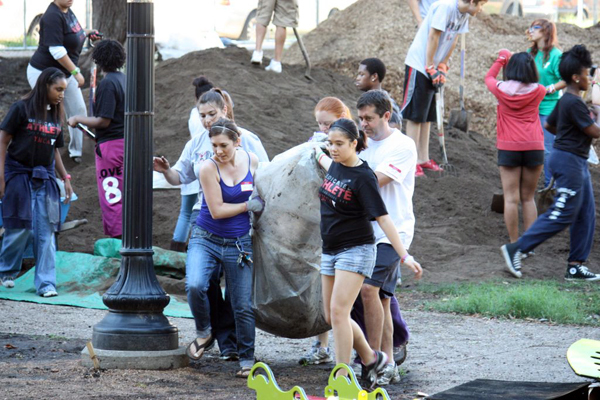 Because they’re there, people rake the wood chips and pick up trash. 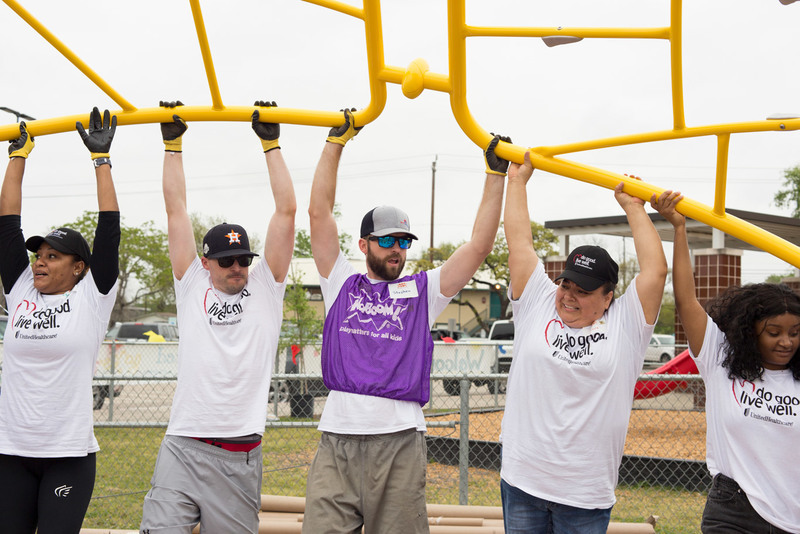 The playground gives them an opportunity to be of service and give what they can give. Before, we were having some problems with rival tagging and some of our younger teenagers getting involved in gang activity. A big problem was lack of options. They’d ask themselves, “What are we going to do today?” and then take the path of least resistance of what was available to them. Kids now have a beautiful playground, and what’s available is a place to come and play and be kids. We have no more graffiti, and we’re not seeing the younger kids involved in gang activity. The other thing that’s happened is the parents are stepping up and taking ownership. They’re saying, “This is OUR playground, this is a family thing going on here.” The people who were using the site because it was abandoned are gone – just through self-governance, not signs or rules or threats. The playground has had an impact on kids of all ages. One of our volunteers has a little boy who’s about two, and before the playground there was no place for her to let him loose. He was always in the stroller. Now he comes to the playground every day—he climbs the climbing wall and goes all the way up to the top of the play structure. Eureka's new playground has inspired community members to come forward and share their gifts, like teaching youth cooking classes. Photos courtesy of The Jefferson Project. Some of our volunteers, including me, had never been involved in a big community project before. Once you get a taste of it, you want more. Now we’re working on transforming the North building of the school into a community event center and renovating three classrooms for all-age recreation, everything from infant toddlers to teens to older people. We are renovating the kitchen into a fully permitted commercial kitchen so we can provide healthy nutritious food at all of our events. 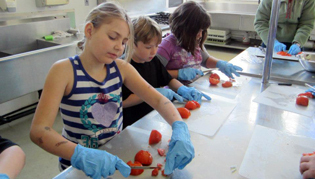 Kids are getting addicted to fruits and vegetables! An organization called Bicycle Kitchen is teaching kids how to fix bikes, so we’re promoting the health and physical fitness of our community, as well as offsetting greenhouse gases. Because we now have a volunteer base, when someone comes forward and wants to do something, BOOM! we’re doing it. A lady called recently and said, “Hey, my mom told me what’s going on down there and I’m a dietician. I’m here for a week and I’d like to teach a class.” We were able to email and call a few parents I met from the KaBOOM! build, and about nine kids showed up. Then a guy said he wanted to do a community drum circle, so we gave him the keys. We’re providing an opportunity for people to share their gifts. We’ve done it. The gates are open. The kids are playing. The community has come together and is hungry to be of service. We’re succeeding. Thank you KaBOOM!. Every day, we work to give kids in need a space where they can make lasting memories and lifetime friends. In doing so, we make our own friends and memories—with plenty of laughter along the way. It is always gratifying to invest time and sweat into a project, and to see it through to fruition. But when when we look back, it's the moments we remember, moments when we made a new connection, or something was said that moved us or made us laugh. Here are our 12 best moments of 2012. What were your best moments on the playground? When disaster strikes, one of the most important things we can do for our children is give them time and space to play. In August 2012, KaBOOM! 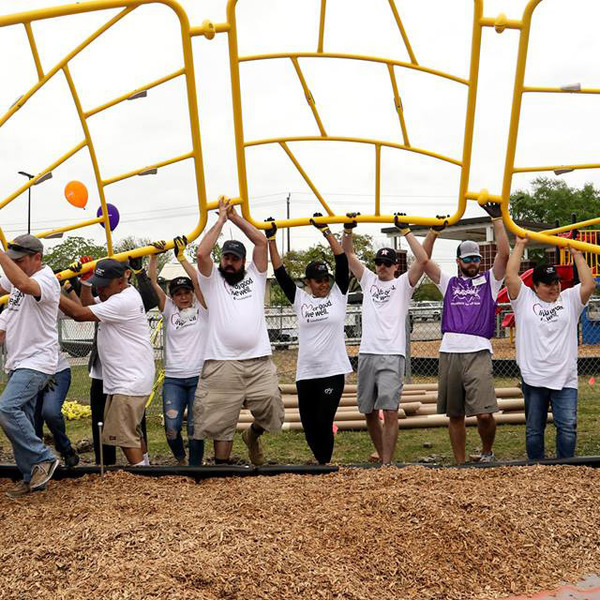 joined forces with the Kansas City Chiefs to build a playground in Joplin, Missouri, a community still reeling from the effects of the tornado that devastated the area 16 months prior. 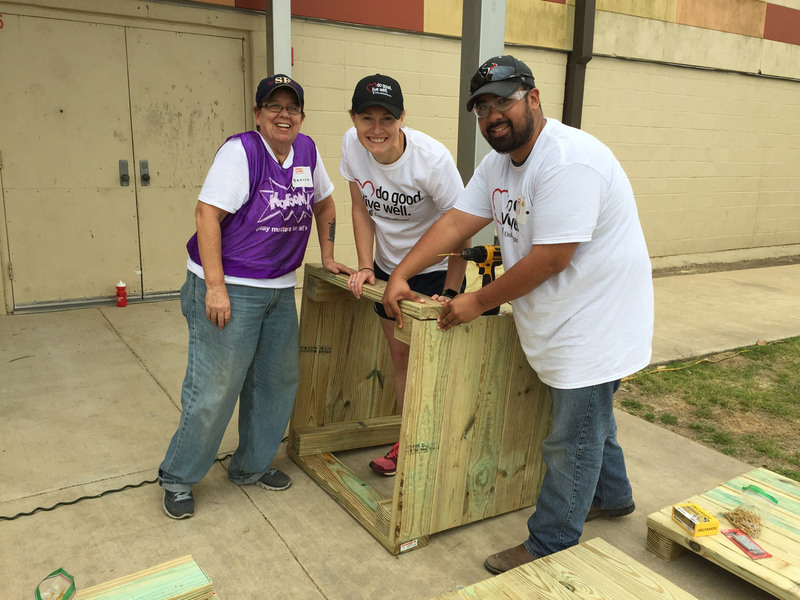 When CJ Huff (above left), the Superintendent of Joplin Schools, recently visited the KaBOOM! headquarters, he talked to us about the many positive effects the playground had brought to the surrounding community. While kids’ talk about suicide had dramatically increased following the tornado, after the playground build, talk of suicide decreased. It’s all too easy to forget that kids bear the stress of their families: lost jobs, lost homes, lost lives. Getting outside and having the opportunity to run, laugh, and play is essential. "Playgrounds are a critical component to the infrastructure in any community," CJ Huff said. 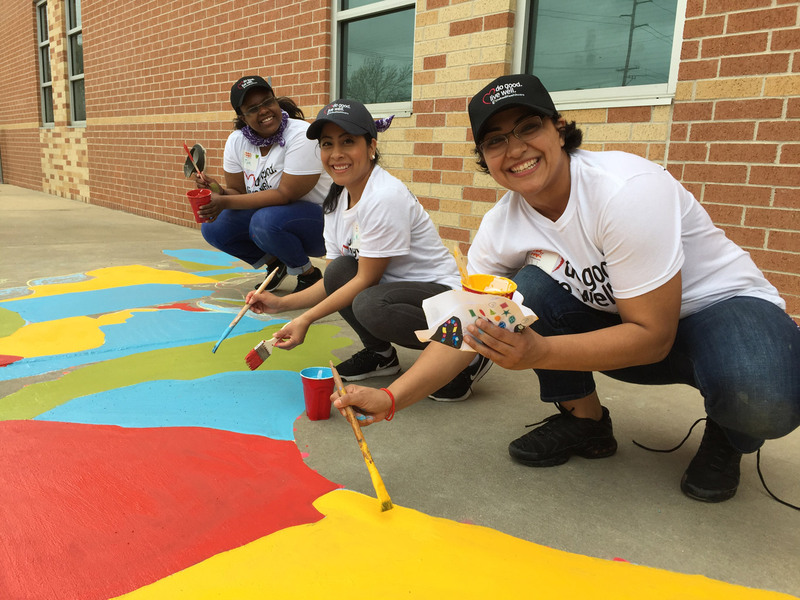 "We also found playgrounds were really a place of reunification in the aftermath of the tornado and a meeting place for children who hadn’t seen each other since the storm." 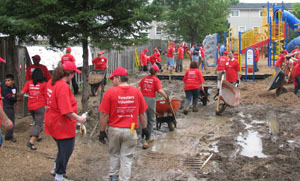 In Elgin, Ill., a handful of volunteers were hard at work readying a site where we planned to build a playground the following day. One helper, local police Commander Glenn Theirault, ventured across the street to an abandoned house in hopes of finding an electrical source. 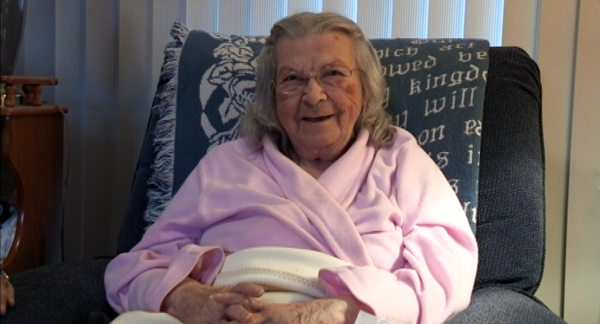 To Glenn’s surprise, he found that an 85-year-old woman named Dorothy lived there. The inside of her house was immaculate, but Dorothy had difficulty moving around and could no longer maintain the outside. She had tried to find help, but nothing came through. As they were talking, Glenn fell right through the rotted front porch! 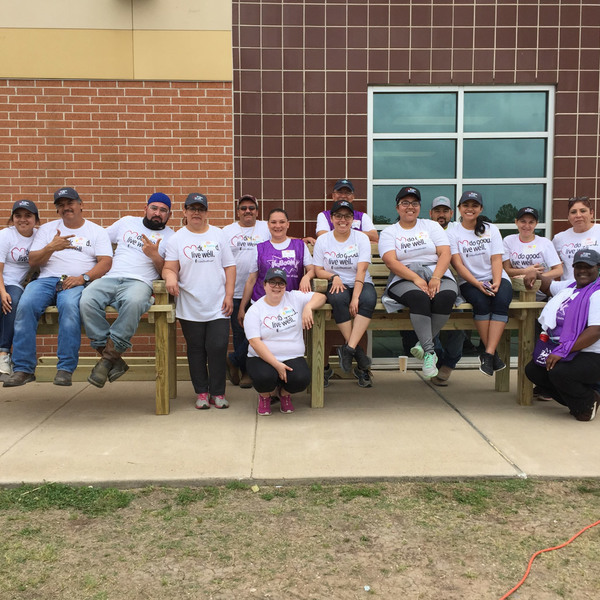 Glenn came back on the playground build day with a crew of volunteers who built Dorothy a new front and back porch, cut her grass, cleared fallen trees, removed an old pool and trampoline, cleaned the gutters, painted the garage, and planted new landscaping. They unearthed Dorothy’s like-new riding lawnmower that she turned around and gave to a 16-year-old neighbor who is trying to start a lawn-mowing business. In return, he promised to keep her grass cut. In November, our CEO and Founder Darell Hammond stepped down for a day so that the winners of our Little Artists contest, four-year-old Jake Bannister and six-year-old Helen Bartman, could assume the post. 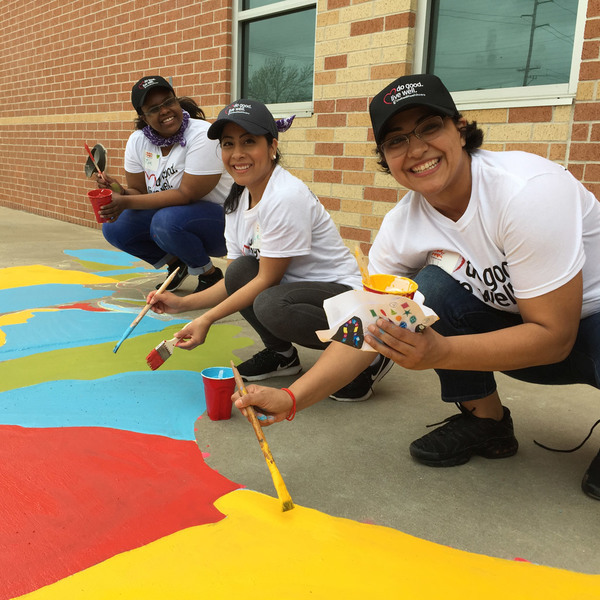 Their busy schedule included signing letters to our Board, running an all-staff meeting, testing out our Imagination Playground™ equipment, and leading a Senior Team huddle at our local playground. Though Jake was initially a bit shy and overwhelmed, he and Helen became close colleagues after they had a chance to play. The above photo shows the two CEOs walking back from the playground as they strategize about effective kazoo-playing techniques. The moment was a moving testament to the power of play, reminding KaBOOM! staff of the importance of what we do. Not everyone believes in the power of a playground—but some can be convinced. That’s what Jason Ellis learned when we partnered with the Alexandria Redevelopment and Housing Authority (ARHA), The Washington Capitals Charities, and So Kids Can to build a playground in Alexandria, Va. Jason, who works at ARHA, found himself challenged by affluent neighbors who did not appreciate his community, much less the thought of a new playground there. Finally, one particularly vocal neighbor decided to meet with Jason and talk through his vision and his work with KaBOOM!. By the end of the meeting, she not only apologized for being unable to volunteer at the playground build, but she also handed Jason a check for $500! Maybe only fools fall in love, but sometimes those fools are hardworking, mulch-shoveling volunteers. Kimmy Miller and Chris Ferry first met two years ago while volunteering at a playground build in Braddock, PA.
Braddock Mayor John Fetterman has since spoken at length about the impact of the playground in his town, which he refers to as the "Grand Central Station of Kidville." He notes that the community has taken an active role in not only maintaining the but also expanding the playground since its initial construction. That's why we KaBOOM! 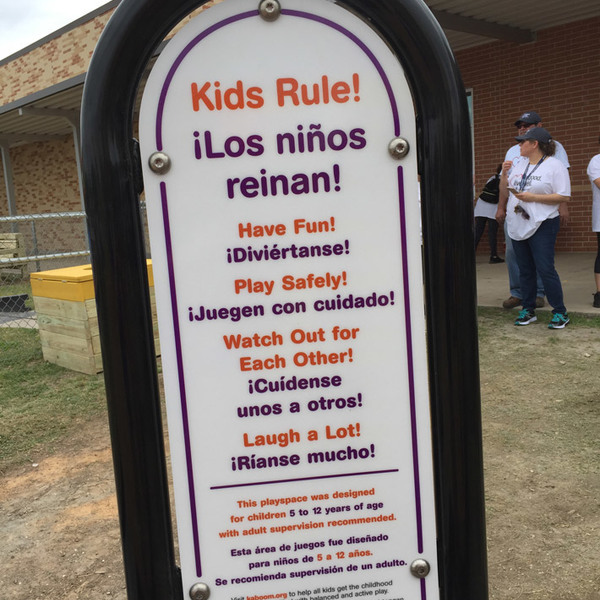 say, “It starts with a playground.” But now we’ll have to add marriage to our list of the many positive ripple effects a playground can set in motion. When we learned that Kimmy and Chris got engaged in December, we made sure to send some KaBOOM!-themed engagement presents their way. Rumor has it they will be wed on the playground. 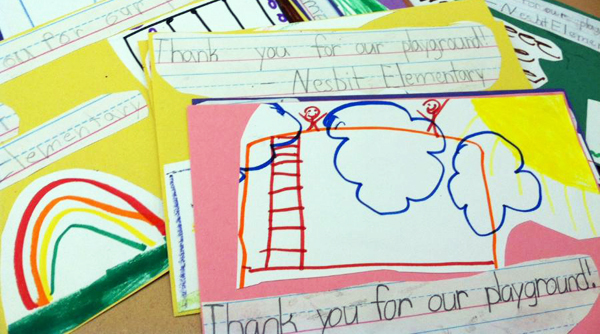 In April, Nesbit Elementary School made KaBOOM! history by hosting the most volunteers ever on site for a single playground build, thanks to the generous sponsorship of DIRECTV. 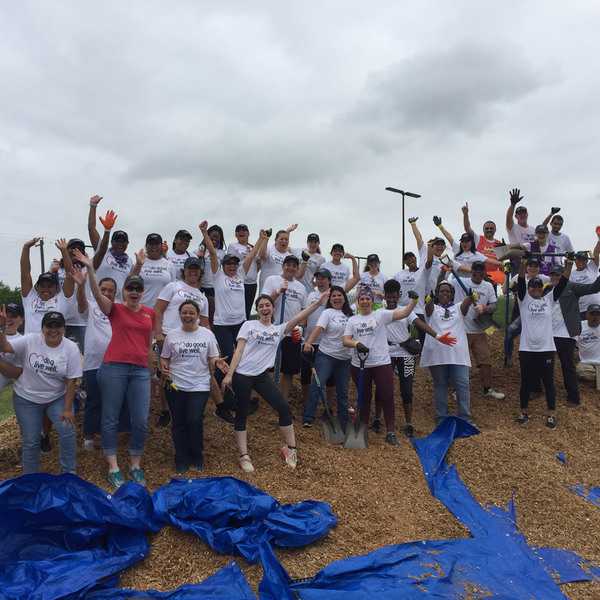 Over the course of one day, 840 volunteers hauled 530 cubic yards of engineered wood fiber and mixed over 80,000 pounds of concrete for the student-designed inclusive 10,000 square-foot playground. About eight months later, we were surprised yet again when we received 50 thank you cards (pictured above) that the kids worked on as part of a continued service learning project. "We still LOVE our playground!" they said. Not everyone welcomes teens at playgrounds—in fact, some go so far as to ban them. But downtown St. Louis neighbors Matt O’Leary and Kelly Kelsey were delighted when 40 teens arrived unexpectedly at the site of a future playground, asking how they could help. Matt and Kelly had long wished that someone would do something about Lucas Park, which for years was littered with needles and trash, and known for drinking, drug use, and other unruly behavior. Meanwhile, the 350 children under age six who lived nearby had no place to play. Eventually they got sick of waiting. Forming a nonprofit called Friends of Lucas Park, they applied for, and received, a KaBOOM! Let’s Play construction grant. 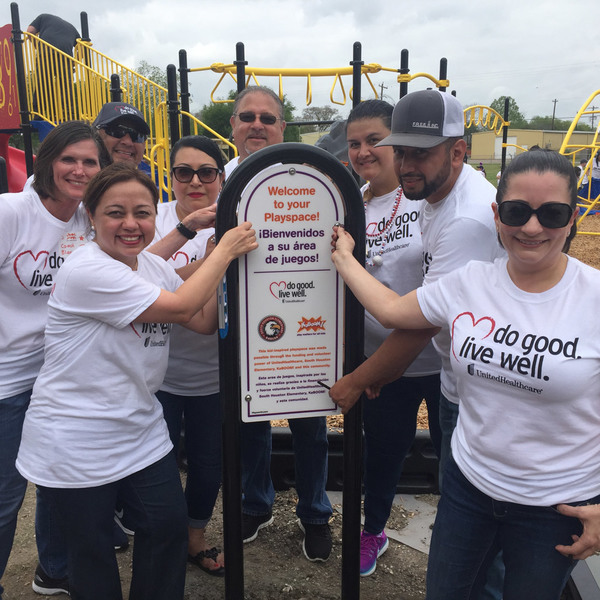 They rallied their community to raise additional funds, and using our tools on Our Dream Playground, formed a planning committee to organize a done-in-a-day playground build. 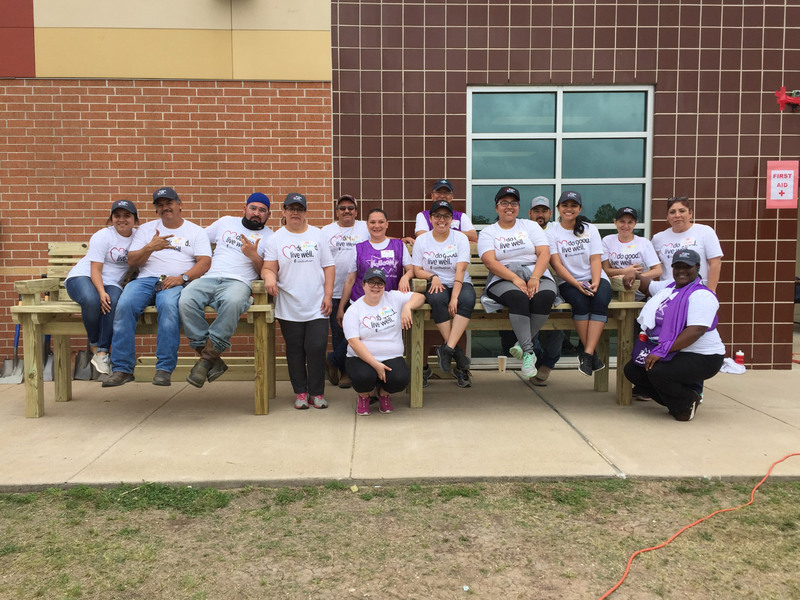 On Build Day, they expected about 60 volunteers, but ended up with a hundred. 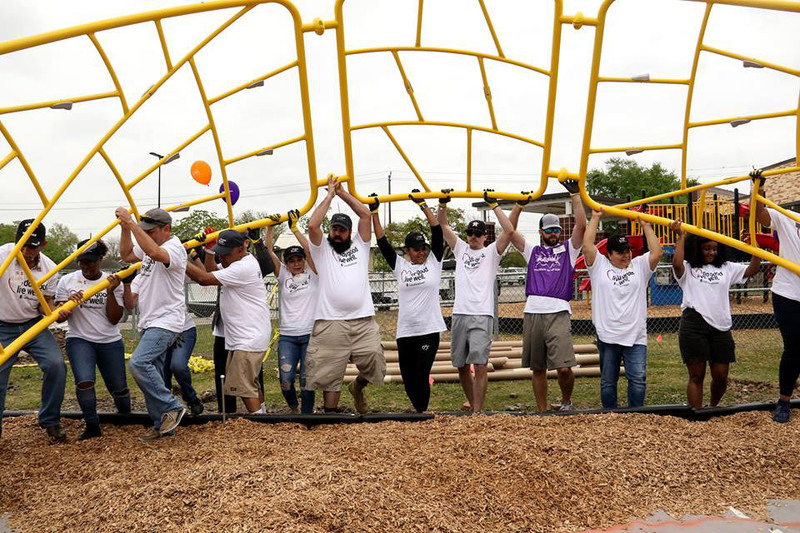 Alongside fellow community members, teens hauled wheelbarrows, shoveled dirt, and assembled equipment, constructing a beautiful new playground in less than 12 hours. Improved sleep is one of the many benefits of outdoor play—beneficial for kids and parents alike. Dana experienced this benefit firsthand. Though three-year-old Gordie had been dropping his naps, she said, “we've been really wearing him out in the playgrounds so he's started napping most days again. [Recently] I told him that when we got home it would be time for his quiet time. He yelled, 'No! I want a nap!'" 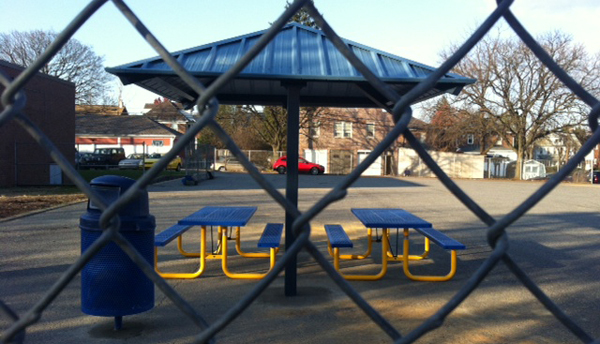 Many school playgrounds are closed after hours, but that doesn't always stop kids from playing on them. Such was the case at William Penn Elementary School in the Playful City USA community of Bethlehem, Pa. Some school administrators might have reacted by punishing the children for trespassing, but not Principal Nathan Stannard. Acutely aware that the kids in this low-income neighborhood needed a 'home playground' and had nowhere else to play, he championed the cause to make a formal agreement to open the playground to the public after hours. 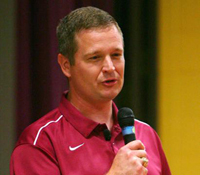 He hopes to inspire other school administrators to do the same. 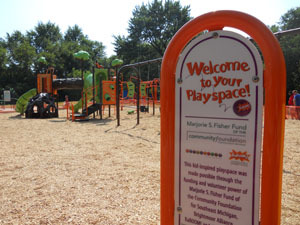 A three-time Playful City USA honoree, Bethlehem received a Let's Play Joint Use Grant, with a goal of opening five school playgrounds to the public in 2012. Thanks in part to the support of school officials like Stannard, they opened nearly double that number. 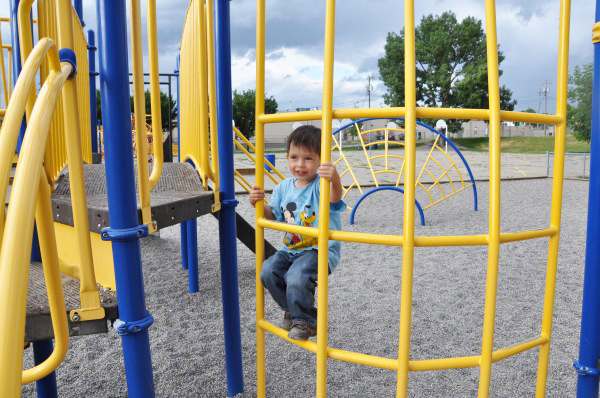 Now, children in nine communities enjoy evening and weekend access to playgrounds that were formerly off-limits. Our hardworking Project Managers are constantly on the road and often participate in conference calls while waiting for flights at the airport. You need to talk quite loud to be heard on the phone at the airport, but apparently traveler Lena deMorais didn’t mind. She gave KaBOOM! staffer Kenny Altenburg the above note (left) while he was wrapping up a call. Kenny didn't see who had given him the note, but after he boarded his plane, a young woman leaned across the aisle and said, "Thank you for buidling playgrounds for these kids." The story doesn’t end there. Once they landed in Portland, Ore. Lena actually came to the playground build that Kenny was managing, with four other volunteers in tow. 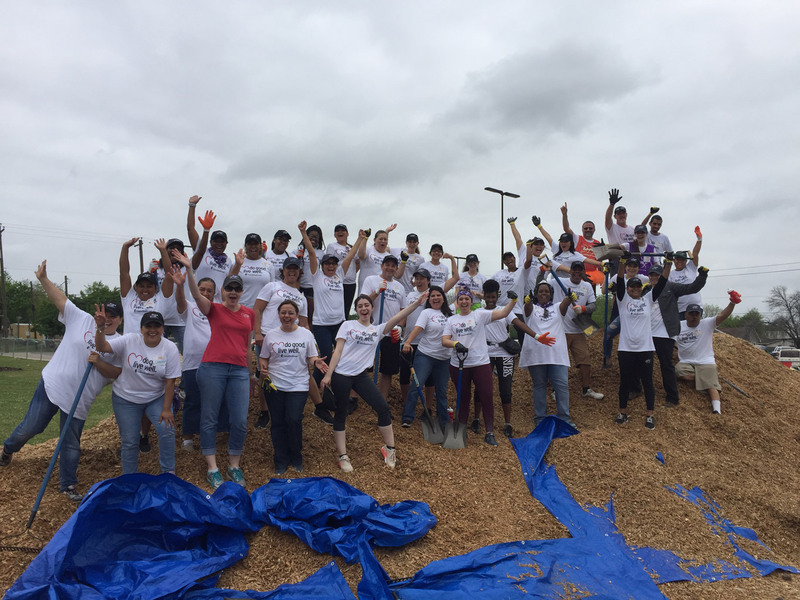 Alongside volunteers from Home Forward (Portland's Housing Authority) and our funding partner Humana, they spent over six hours mixing concrete, shoveling mulch, and assembling playground equipment. It's always nice to get a firsthand reminder of why we do what we do. We all know that play has myriad physical, emotional, cognitive, and social benefits, but at its core, play is just plain FUN. That's why, when the National Building Museum opened its amazing exhibit, PLAY WORK BUILD, we had to check it out. The exhibit features Imagination Playground™—those "awesome blue blocks" we all know and love, but also mini versions of the blocks, as well as a one-of-a-kind virtual block play experience. The only experience more rewarding than playing ourselves is watching our own children play. Pictured above from left to right are daughters of our COO James Siegal, Software Engineer Lukas Eklund, and daughter of Sr. Manager of Online Content and Community Kerala Taylor. As an added bonus, Kerala reported that after playing with Imagination Playground™ blocks for over two hours, her 13-month-old proceeded to "sleep through the night for the first time EVER!" Back in 2010, we worked with the Windsor Cove housing complex (formerly known as the Palms) in Orlando, Fla. to replace its decrepit playground. The community had been brought to its knees following a mass shooting in 2008, and many of the mothers who lived there were afraid to let their kids play outside. Windsor Cove resident and mother of three Yolanda Robinson told us, "You have people shooting and you have to think—well if I send my kids outside today they just might get shot." When KaBOOM! staffer David Flanigan recently traveled to Windsor Cove to check in on the playground we had helped build there three years ago, he was hopeful but anxious. The last thing he wanted to find was an empty playground and parents still fearful of sending their children outside. He need not have worried. He found the playground crawling with kids and a community that, according to resident Melody Hills, "continued to talk to one another and come together, despite the challenges." Melody told David that the mothers who were directly involved in the playground planning and building process moved toward self-sufficiency. "Four of the women gained employment, two went to school, and two moved out of the Palms Apartments Community," she said. "But, most of all, I will never forget the looks on the faces of the children when the playground was completed. That was priceless!" 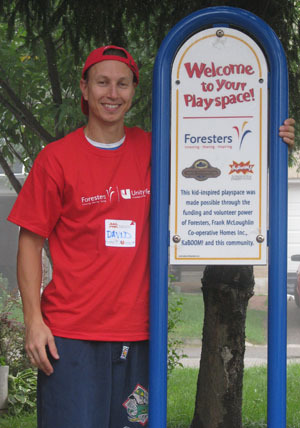 In 2012, Foresters will build 20 playgrounds and support 26 DIY playground improvement projects, providing children and their families with a safe place to spend quality time together and have fun. Three builds in Atlanta, Houston, and Los Angeles (pictured) have already been completed. 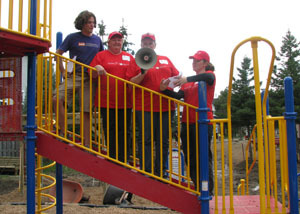 In addition to building playgrounds with KaBOOM!, Foresters is a member of the Leadership Circle within the KaBOOM! National Partner Program. This means Foresters provides long-term guidance and support for KaBOOM! by investing in programs that have a lasting impact on the well-being of families. Learn about how you can impact your community with Foresters at MyForesters.com. On August 31st, 2011, KaBOOM!, Brightmoor Alliance and the Max M. and Marjorie S. Fisher Foundation built a great new place to play in Detroit. Just a week after the build, Cleo, a neighbor from across the street, has stepped up to oversee the horseshoes and has already begun to do maintenance checks on the playground! Play it forward with a donation today to keep inspiring communities like Detroit so they can make difference in their neighborhood. On May 6th, 2011 KaBOOM!, Friendship Southeast Elementary Academy and Dr Pepper Snapple Group built a great new place to play in Washington, DC. As a result of the build, the school is going to start a Keep it Green program for recycling at the school. Since Build Day the community has never been more revived. Everyone knew, no matter where they came from, who they are, or what they do, that they did it together as one. The kids are starting to smile a lot more and can’t wait to use the playground all the time. 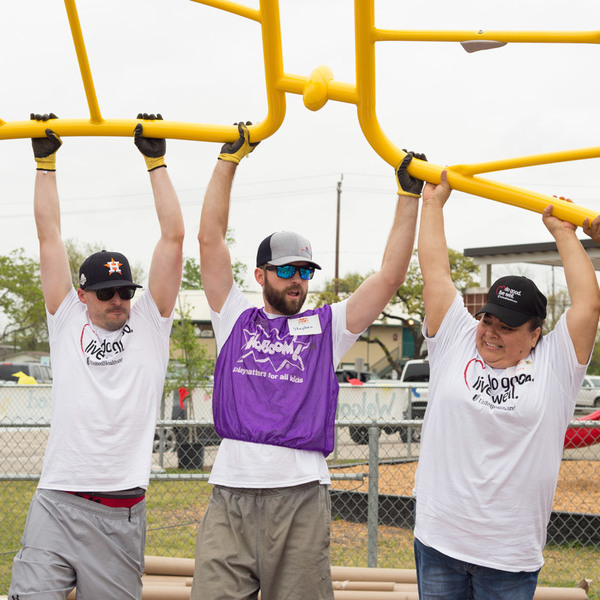 Play it forward with a donation today, because it starts with a playground, but that’s just the beginning. 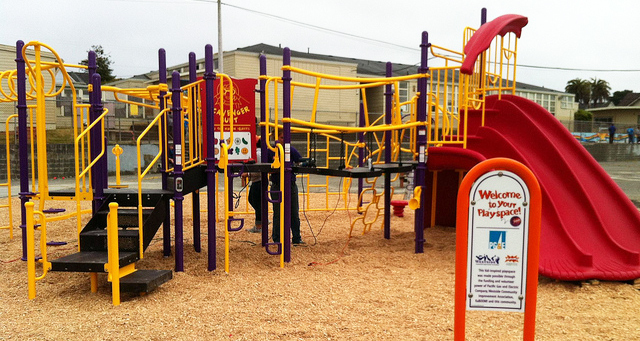 "My first playground project presented many challenges. The arsenic-laced soil where they playground was supposed to be caused a $60,000 problem and a year’s delay. The second playground I built was another challenge – the playground equipment had been purchased years before, and had, by then, fallen out of code with the American Disability Act. 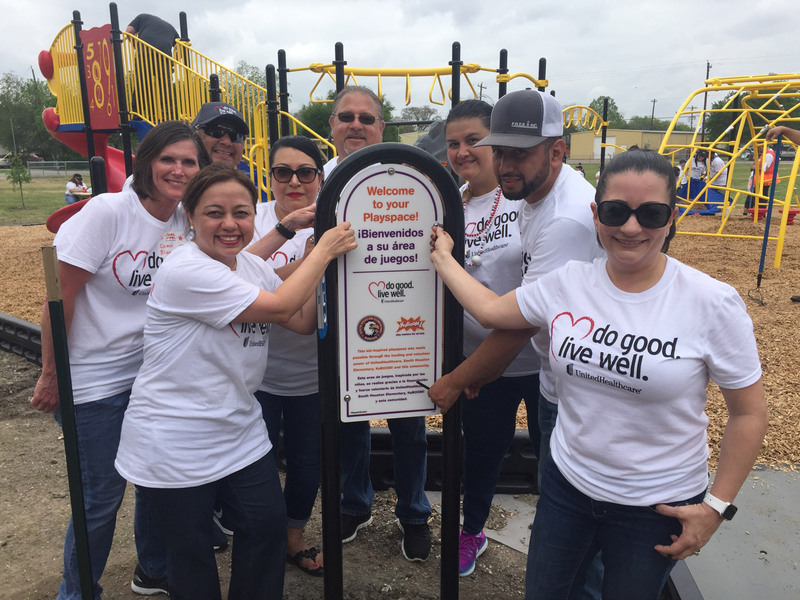 But, we saw this as a blessing in disguise – while we had to fundraise to purchase additional playground equipment – the new equipment meant the playground would be accessible to ALL children. The third playground project I led was on the rooftop of an 18-floor building with a broken freight elevator. That, paired with epic heat and torrential downpours made for possibly the worst volunteer day I’d ever had. You have to wonder why anyone, after all that, would build a fourth playground, which is what I did this summer. I work in early childhood development in Worcester, MA. Years ago we did a study as to why so many kids had developmental delays and one obvious need bubbled to the top – we needed more and better playgrounds. I knew what I had to do, and I went to KaBOOM! for help. After attending several days of training, and working alongside KaBOOM! to build a great new place to play, I returned home and got to work. Four amazing playgrounds later, I know it was worth all the blood, sweat and tears that went into them. I can see it in the faces of the kids playing there every day." Dianne built once with us, and four times (so far) without us, and now there are five more great places to play in the country thanks to her. Play it forward so we can keep inspiring and teaching people like Dianne to build great places to play in communities that need them. "When we moved into our neighborhood two and a half years ago, it was (and is) still very much in the midst of recovery from Hurricane Katrina. We were immediately struck by the lack of community space...somewhere for kids and neighbors to gather, play and build relationships. Our local 'playground' – which consisted of a broken metal slide and two swing-sets with no swings – had been identified by the city government as one that needed to be rebuilt, but there was no information about how or when that was going to happen. That’s when KaBOOM! happened. I sent off a quick email to a staff member there, Shira, and within 30 minutes we were on the phone talking about our new playground. That was late September; our playground was built on December 18th. Our playground, and Build Day, accomplished everything we thought it might – kids and adults are both meeting their neighbors and building relationships – it’s truly incredible. When we were chosen to receive a new Imagination Playground, a set of large blue foam blocks like life-size tinker toys, I knew we were truly blessed. We take these blocks out into the community as often as we can – to schools who are still without playgrounds, to community events and our monthly movie nights. Recently I discovered that by creating a loose perimeter for the blocks kids are playing even more WITH each other, instead of just grabbing a few blocks and playing by themselves. 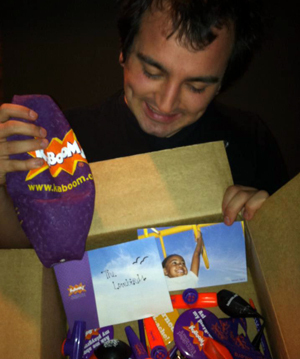 I am humbled and so thankful for everything we’ve received from KaBOOM!." Alf spoke up for the community he knew he could have, and with our help, and a lot of work, his neighborhood is thriving. 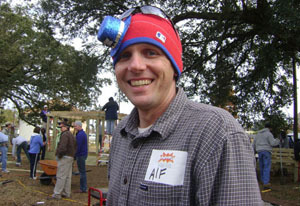 Play it forward with a donation today so we can keep building up neighborhoods like Alf’s. 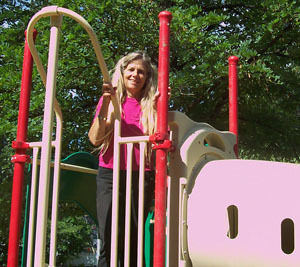 "In 2007, we were notified that our playground no longer met safety codes. It was made of wood that had been treated with arsenic. Even though it was the heart of our co-operative community (and the whole world to the kids) it had to be removed. We were broken hearted. After a recession that left us close to bankruptcy, we could simply not afford to replace it. But I had to find a way to get the kids a playground. I heard about KaBOOM! and sent in an application. After several months had gone by, we got a call from the KaBOOM! staff to tell us we had been chosen. They had found a sponsor and were going to help us build a new playground. It was like winning the lottery! When it rains, it pours, which is exactly what happened the day and night before our build day, leaving a thick sloppy field of mud, approximately 6" to a foot deep. I was panicked that we wouldn't be able to build, that volunteers would take one look at the mud and bolt - but I was wrong. People did leave, but only to go home to get boots and then come right back. At the end of the day, the mud made the end result that much sweeter. The feeling we got from the accomplishment, the feeling the kids got from knowing they were involved, it was so much more - it was like a barn raising! After Build Day people were genuinely nicer to each other. Parents hung out on our new benches while their children played together. Since the kids were involved in building it, they take amazing care of the playground. What would we have done without KaBOOM!?" Jackie helped lead her community to replace a playground and bring the heart of their housing co-operative back. 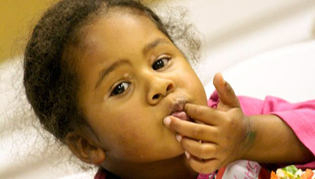 Play it forward with a donation today, so we can continue building hearts of communities.